Finally back on the road together after a lengthy hiatus due to the birth of my daughter, we were itching to get to our first attraction. Lucky for us, the town of Council Bluffs sits right on the border of Nebraska (where we'd flown in) and houses the only 3 story revolving "squirrel cage" jail ever built (and the largest health food store in southwest Iowa, but that's another story for another time). The theory behind the squirrel cage jail is that it can be operated securely using a minimum number of staff members. Think about a round package of needles: the housing of the package has a small hole in it and can be rotated. The needles are stored in separate compartments and the door of the housing must be rotated over one of the compartments to get the needle out. . . The squirrel cage jail is the same concept, only instead of plastic, it's made of steel, and instead of containing needles, it houses wild-eyed axe murderers. 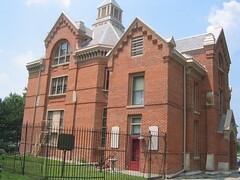 The exterior of the jail actually looks like a nice Victorian house, but when you enter, you see it's really just a facade for the 3 story drum divided into wedge-shaped cell blocks. The entire cell block can be rotated with a hand crank operated by a single jailer. The fatal flaw to this system is that it takes about 3 minutes at an absolute minimum to empty the entire cellblock, and in the event of a fire, it would be virtually impossible to evacuate safely. Because of this, the fire marshall modified (ie: cut the bars) on a group of the cells lowering the total number of available cells. Ultimately, it was not a cost-effective jail any more because of the limited capacity and had become outdated and dilapidated over the years. The jail closed in 1969. It had been in continuous operation since 1885. There is evidence of the rockin' good time the prisoners had there in its heyday, though. Every day, the jailer would release the prisoners outside of the rotating cell block to the "activity area" surrounding it. They used to climb up the sides of the three story drum and burn their initials on the ceiling with flaming bits of toilet paper. Those initials and names remain today.